To me this set would look so much better with white pants. Does anyone know the reason why the MLB won't let teams wear white pants on the road (but they'll let teams wear the same color tops)? That seems even more ridiculous than the NFL helmet rule. Going by the background, that was during spring training, where the jerseys are usually the same color every game whether home or road. White vs. Gray has been the defining characteristic of baseball for generations. Baseball has to walk a fine line between tradition and innovation, and I can’t fault them for deciding this is one of those places to err on the side of tradition. I can see that, I'm all for tradition, but when they allow things like we saw in the World Series a few years back (royal blue Cubs jersey vs Dark blue Indians jersey), I'd say they've missed the mark on tradition. I'd much rather watch the Cubs in all white vs the Indians in navy over white. Much more aesthetically pleasing as it doesn't look like a scrimmage. Wait. The gray pants must be a newer rule. So there goes the tradition thought, right? Nah, there was a relative blip, about ten years where some clubs were experimenting with white pants on the road to match their crazy-color shirts. But baseball stabilized, and returned to the traditional gray on the road. I can see that, I'm all for tradition, but when they allow things like we saw in the World Series a few years back (royal blue Cubs jersey vs Dark blue Indians jersey), I'd say they've missed the mark on tradition. That is undoubtedly why they’re no longer allowing clubs to experiment with white pants on the road; color v color makes it harder to identify the home team at a glance. Pants are one way they can maintain traditions while allowing experimentation (especially jersey experimentation, which tends to be the most lucrative). As I said, they seem to regard it as a balancing act. Just because they allow some experimenting doesn’t mean that all constraints should be removed. Seems like from this Uni Watch article there may not be rule but rather teams just aren't doing it? The rules as currently constituted don’t specify “gray”, only “not white”. 3.03(e) A league may provide that each team shall wear a distinctive uniform at all times, or that each team shall have two sets of uniforms, white for home games and a different color for road games. This is how teams can have powder blue or tan road unis. They just can’t have white. So I'm actually not that bothered by how the blue BP/ST jersey looks when paired with the road gray pants. I can see what others mean, but don't necessarily think a change needs to be made for that reason. MLB needs to enforce the rule that stipulates the road team wear gray/not white. The problem is that it feels like almost every team these days has either a blue or red alternate of some shade. Gray vs. white pants is a great way to make the distinction if/when there's some similarity. The obvious solution would be to make the blue jersey (and fixing its numerous flaws and adding a wordmark instead of logo patch) part of the regular season rotation, but worn as a home Sunday alternate only. The previous red-orange alternate was used in this way aside from a brief stint when it was worn on the road. Fix the black jersey so it's not black on black (so you can read the lettering) and make some version of it the BP/ST jersey. The Marlins have overemphasized black for too long, so I'd be glad if they didn't have a black alternate for the regular season. I think the cap logo looks great even with all the black. Sue me. You think blue over gray vs blue over white is better than white/white vs blue/white? Wouldn't it be better visually to just stipulate no color vs color jerseys? If home team is wearing a color jersey, away team wears gray. If home team is wearing a white jersey, away team can wear gray or color jersey. In the end, I just never want to see a blue jersey vs blue jersey game (or any other same color vs same color). The Marlins use this almost exclusively in their media guide. Can't help but think it would work better as the cap logo. I do suppose that's one solution, but given how popular solid color alternates are right now, I cannot imagine MLB stipulating that only one team wear them for each game. Though I'd personally like to see alternates worn less all around. The other issue is that some alternates are worn on scheduled days (which I like) and deferring to what the home team is wearing would derail that. But I suppose that's not a big deal. Maybe it's the traditionalist in me, but I think that pants colors is the best way to distinguish between home vs. road. Most solid color tops like either fine or good with gray pants so I see no real reason to make that change for the few exceptions. That looks worse to me (too noisy) but I would need to see actual stitching to know for sure. I also don't think a white outline would solve the logo's flaws. The white negates the blue even more when it should really be emphasized. They should just use the spring training cap instead. This. It's so much better, especially if they even out the stitching that creates the faux 3-D look. The colors come through better on the spring training cap and it's much less visually cluttered. 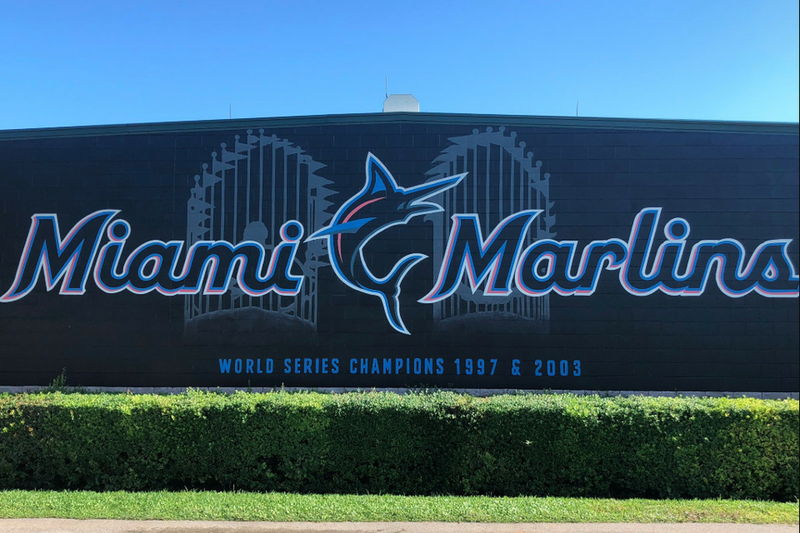 Something about the normal cap logo just seems haphazard with part of the fish tail disappearing into the center of the M. I also never really understood or came around to liking that rightward lean. Slight purpling effect with the competing blue and red accents. I'd love to see them embrace the fish-only logo going forward with some added blue. The rules as currently constituted don’t specify “g﻿ray”, only “not white”. 3.03(e) A league may provide that each team shall wear a distinctive uniform at all times, or that each team shall have two sets of uniforms, white for home games and a﻿ different color﻿﻿﻿ for road games. This is how teams can have powder blue or tan r﻿oad unis. They just can’t have white. The words "may" and "provide" and "or" and "uniform" make that a little ambiguous. What does their definition of "uniform" mean? Do they further define that as top and bottom? "Distinctive uniform at all times" - that implies that they could just wear a "distinct" uniform regardless of white or gray being involved. Is that a trick of the light or is the mural actually pink? It looks much better than the red they use. If they have to keep adding white outlines to the logos on a black background, that seems like a concession to me that the black on black doesn’t simply doesn’t work. Although adding a white outline improves legibility, I think it looks way worse, as personally I can’t think of an example where black & white + two other colors ever looks good. It’s clear to me now that they should have just gone with blue letters, a black outline and a caliente red shadow/outline.